The festive period is drawing closer, and customers are ready to spend big bucks on holiday gifts for their nearest and dearest. As specified in a new NPD Group holiday shopping report, an average customer will spend around $700 on holiday gifts this year. Another research by Adobe Analytics predicts that the U.S. online spending will be $124.1B during the holiday season, and the majority of customers plan to spend 57% of their holiday budgets online. For brands of any size, it means an opportunity to drive sales. What makes you any different from the millions of other businesses hoping for the attention? To stand out from your competitors, you should avoid being too salesy and pushing your customers too hard, and the best way is to boost engagement to draw customers’ attention to your business first. The good news? With the rise of eCommerce, there’s no need to waste your marketing budget on broadcast media, product placement, outdoor billboards, etc. Nowadays online shopping offers customers an easy way to discover and buy items: 96% of US customers have made an online purchase in their life and 51% of Americans prefer to shop online in 2018. Thus, sending email newsletters is a perfect way to connect with customers, communicate new ideas and events to subscribers who are interested in your product, and therefore advertise your brand. Moreover, email newsletters can boost engagement. Although Black Friday is considered to be the unofficial kickoff to the holiday shopping season, it’s not too late to jump on the bandwagon and start a holiday sales campaign, promoting it in your email newsletter. To make the most out of your email marketing in the holiday season, it’s important to understand key principles of writing newsletters that get clicks and engagement. Focus on one topic idea. The rule is simple: one topic idea for one newsletter. Brainstorming your topic idea, keep in mind that it should be relevant to your readers. If you can grab their attention, it’s more likely you will make them want to read the whole newsletter. Write eye-catching subject lines. Since the number of consumer emails sent and received per day totals 111 emails a day, you can’t afford to get buried in the inbox. Thus, it’s important to write eye-catching subject lines that grab and hold customers’ attention. Forexample, you can include emjoiis: it draws attention, creates a sense of friendliness, and increases your open rate. Keep emails simple and short. The brutal truth: your subscribers are too busy during the holiday season to read your boring newsletters. If you want to make customers read your emails, keep emails simple and short. The main idea is to provide readers with interesting and useful information that can solve their problems. For example, it’s no wonder people are looking for gift ideas this period, right? Add visuals. Not only will images break up the monotony of the text, but they will also keep your audience hooked. Here’s the deal: the 90% of the transmitted information to our brains is visual and people are visually-oriented, so it’s easier for us to perceive images. Build your own festive holiday design. Most people love holidays, and we want to get in the holiday mood. And the easiest way to remind your subscribers of the holiday season is to create a holiday template for your newsletter. If you use holiday email templates, that’s great. If you build your unique festive holiday design, that’s even better. Stick to the holiday calendar. Once your perfect holiday newsletter is ready, it’s time to think when you should send it. Actually, there are many occasions during the festive period (Thanksgiving Day, St. Nicholas Day, Christmas Eve, New Year’s Day, etc. ), so it’s important to set a goal for your newsletter and stick to the holiday calendar. Bombarding your subscribers with too many emails isn’t an option: spammy emails are the main reason for the majority consumers to unsubscribed from brand emails. However, if you’re lucky to make up holiday newsletter ideas that boost engagement and convince subscribers to take an action, you can bring your business to the next level. During the holiday rush, customers are looking for new gift ideas for their nearest and dearest. Therefore, it’s perfect period to launch a new product that can satisfy their needs and wants. Before turning your subscribers into customers, you need to engage them, and introducing a new product is a great way to spark their curiosity. As specified in the Nielsen report, 63% of customers like it when manufacturers offer new products. For business owners, it’s a chance to generate a buzz around your brand and increase sales. For example, Lancome has created holiday cosmetics collection. With the limited-edition holiday beauty collections, the brand encourages their fans to surprise their friends and family with these gifts. Adding a call to action button, the brand provokes an immediate response and leads the subscribers to the landing page with the variety of gift sets. Since the company provokes potential customers’ interest, their subscribers are more likely to consider these products as an option. The holiday season is a period when customers buy things not just for themselves but also for their friends and family. Moreover, 6 in 10 holiday shoppers plan to take an advantage of retailers’ sales and discounts to make additional purchases. Thus, it’s the ideal time to send out special offers and discounts. The bigger your discount is, the more chances it will attract your customers’ attention. 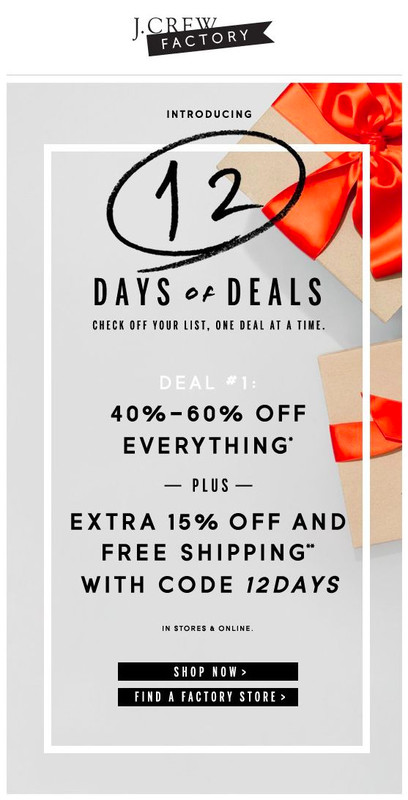 For example, it’s no doubt that J.Crew subscribers will hasten to click the newsletter to find out more about the sale. What can we learn from J.Crew? The combination of a great discount and tight deadlines is a proven way to encourage subscribers to take an action faster. But smaller businesses can’t afford big discounts. Selecting the appropriate discount rate can be difficult, so you’d better get math assistance from experts to set the right discounts, and therefore avoid damaging your brand or cutting into your profits. The festive season represents the period of giving, and it’s a well-known fact that people love gifts. When you run a social giveaway, you build loyalty, brand awareness, and trust. Moreover, it’s a chance to enter an already-established community and promote your brand among your loyal customers’ friends as more than a half of customers say they are more likely to share a link to a holiday contest or giveaway. Running social giveaways is a waste of time until you have participants. The more people take part in your competition, the better for your brand. And the best way is to attract your loyal customers. Thus, Gillies Coffee sent a newsletter with the giveaway announcement. When you inform your subscribers about the giveaway, you provide them with a chance to win a great branded gift. As a result, they are more loyal to your brand as they feel you take care of them. Plus, you can implement one marketing technique and offer all participants a small discount as a bonus for their activity. Who else wants to receive the neatly wrapped gifts? For the majority of people, gift-wrapping is a chance to get into the Christmas spirit. However, 52% of people dislike wrapping as it takes too much time. During the holiday rush, customers are pressed for time to wrap gifts. For brands, it’s a perfect chance to engage potential clients and stay one step ahead of competitors: offering gift wrapping is a perfect way to show your care. That’s what Jigsaw does, offering the clients an opportunity to save their time and budget and get wrapped gifts. It’s up to you to decide whether you want to charge for the service or not, but offering it is a great way to engage customers and attract attention to your brand. With gift-wrapping, you offer customers a convenience they will never forget. “A gift guide is one of the most powerful tools you can have during the holidays. It allows you to showcase your products, inspire shoppers, and stay top of mind throughout the season.” says Francesca Nuicasion, retail expert and content strategist at Vend. Esprit, for example, has created a simple holiday gift guide, based on their products. Not only will it hint their subscribers at what they can buy for their friends and family, but it will also promote their products in an interesting and engaging way. Since the holidays are coming closer, shoppers crave for gift ideas for their friends and family. When you provide subscribers with a holiday gift guide, you solve their problem and help them make a choice. As a result, it’s a powerful way to engage with your holiday customers. Do you know that charitable donations increase by 42% during holiday months of November and December? For many people, the holiday season is a period of giving back. When you organize a holiday giving program and announce it via email newsletters, you get the support of your subscribers. People want to be a part of something significant, so they engage in the activity with ease. If you’re a Starbucks fan, it doesn’t require much effort or time to take part in the holiday giving. At the same time, you become a member of something significant, so people are more likely to consider this coffee chain when it comes to getting their morning cup of coffee. To make the most out of promoting your products, you need to combine offline and online marketing, and hosting holiday events is a great way to sum up your annual results. Plus, it’s a proven way to engage your customers. Thus, you can announce events via email newsletters during the holiday season. Let’s take a look at a newsletter by CATT. This simple and short email informs the loyal customers about the upcoming event and invites them to attend an event. The good news? The recipients feel valued to be invited to the party. Therefore, it increases the loyalty toward the company and it positively affects the purchase decisions when it comes to buying holiday gifts. According to Forbes, authenticity is the main factor for building loyalty toward a brand. Moreover, it’s a way to positively influence customer perception. Thus, companies seek out ways to bring transparency to their brands, and taking subscribers behind-the-scenes is one of the options. Here’s the deal: Although CPW Dentistry introduces the team members every month, the company has put much effort into creating a special holiday edition, featuring their treatment coordinator, Lauren. During the holiday season, people want to get closer to other people. Thus, it’s a perfect time to give customers a look behind the scenes by introducing team members and sharing something personal. When it comes to the holiday season, it’s considered to believe that most people jump the gun on buying gifts. However, 3 in 4 consumers said they backed out of a purchase at the last minute last year. For brands, it means they need to send last-minute reminders to help people make their holiday purchases on time. Since customers are afraid of missing out something important, last-minute reminders persuade them to take an action faster. Moreover, these people are pressed for time to think much about the gift ideas, so they can make impulse purchase decisions to meet the deadlines. For brands, it’s an opportunity to drive engagement and last minute sales. Although businesses want to grow revenue during the holiday season, it’s also a great time to establish a good connection with customers, sharing your gratitude and warm wishes. Sending greetings to your customers is a great investment in your relationships: no matter what your product is, your customers want to feel valued. Thus, it’s important to send holiday newsletters with greetings. Just look at Barneys New York. With a short and sweet design, they just wanted to wish their community all the best. Think about it. When you greet your community on a holiday without trying to sell your product or service, you establish an authentic connection with your potential customers. The holiday season is the biggest gift-buying period, so it is perfect time for your business to drive sales. However, working in a competitive environment, it’s important to grab and hold subscribers attention to boost their engagement, and therefore stand out from other businesses. Thus, you need to lay a bet on email newsletter ideas that engage. The more engaged your subscribers are, the more likely they are to buy your product. Do you have another holiday newsletter idea that boosts engagement? Are you ready to engage your subscribers during this holiday season?